The market is segmented by Vehicle Type (Cranes, Backhoe, Loaders, Excavators, Dump Trucks), Drive Type (IC Engine, Hybrid Drive), and Region. One of the major factors driving the growth of the market is the growing construction industry, especially in developing countries, owing to numerous growth opportunities in infrastructure, residential, and non-residential sectors. For instance, the rise in construction of multi-family houses (with the growing trend of nuclear families), and increasing investments in construction of roads, highways, smart cities, metros, bridges, and expressways due to growing population and urbanization. The growing trend toward automation is expected to drive the growth of the market. However, factors such as stringent emission regulations for construction machinery are expected to hinder the growth of the market. 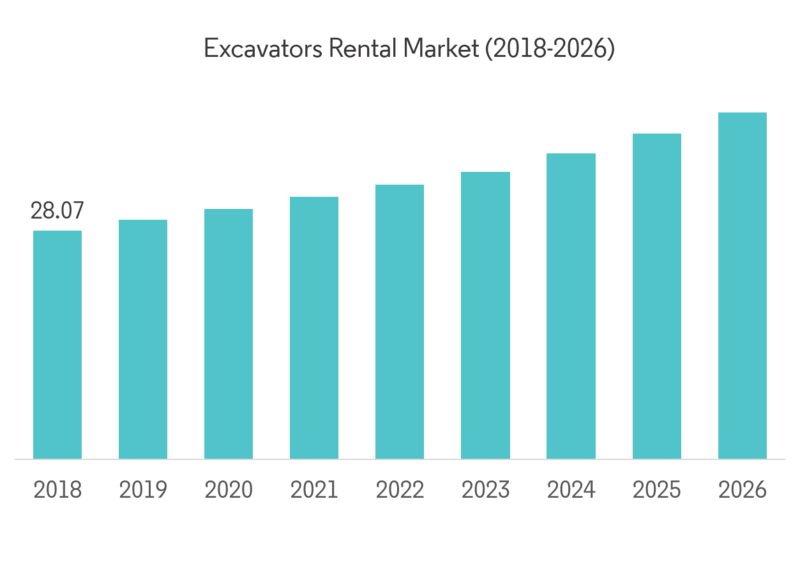 The excavators sub-segment in the global construction equipment rental market was valued at USD 28.07 billion in 2018. Excavators are typically of two types, namely wheeled excavators and crawler excavators. Among them, crawler excavators occupied a major share of more than 70% of the global excavator rental market in 2017. As most rental companies purchased low-cost crawler excavators over high cost wheeled excavators, because the former equipment offered high stability for digging operations on rough or uneven terrains, compared to that of wheeled excavators. However, the operating cost of wheeled excavators have been less compared to that of crawler excavators, as the wearing out of crawlers’ undercarriages and their replacing or refurbishing are an expensive and time-consuming task. Thus, some regions have started to adopt wheeled excavators in construction projects since 2010. Europe ranks the highest in the usage of wheeled excavators compared to the United States. As most of the work done in Europe takes place in urbanized areas, while in the United States work projects majorly included clearing land and digging. While, in Asia-Pacific and Middle-East & Africa, the usage of excavators covered more than 55% of the total construction equipment rental demand during 2015-2017. In the above regions, a majority of the excavators used were crawler-types and very few operations in construction job sites preferred wheeled excavators, especially compact wheeled excavators. With growing infrastructure developments across the globe, the need for excavators was evident in almost every construction project. Thus, many rental companies across the globe continuously invest in purchasing new excavators to keep the average age of its excavator fleet at a potential of 2 to 3 years, to satisfy a wide customer demand, who are looking for advanced and efficient excavators. For instance, Theisen Baumaschinen Mietpark GmbH & Co KG, one of the leading construction equipment rental companies in Germany, has recently purchased 32 new wheeled (12 units) and crawler excavators (20 units) from Doosan in 2018, to strengthen its rental equipment fleet for regional Theisen centers across Germany and in Vienna (Austria). 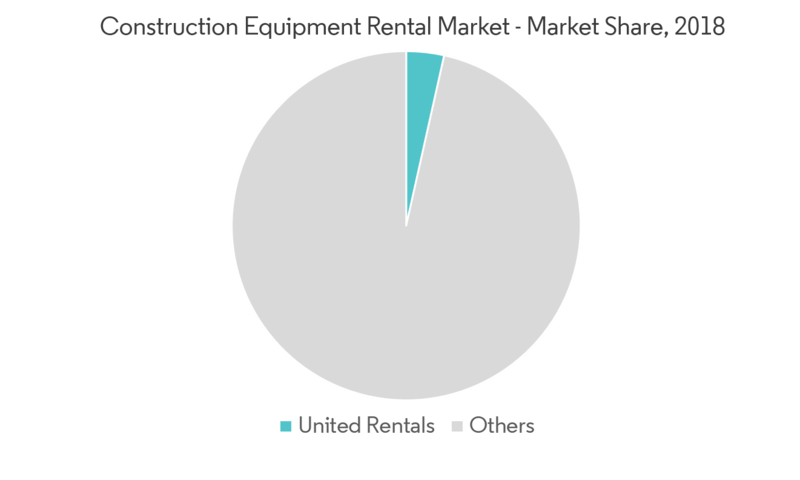 The Asia-Pacific construction equipment rental market dominated the global market, with a market share of 36.70% in 2018. Asia-Pacific is one of the largest markets that witnessed a boom in construction and infrastructural development, because of the growing emphasis by governments on developing infrastructure for a sustainable economy. This region has witnessed growth in the number of Special Economic Zones (SEZs), airports, metro construction, highway constructions, dams, hydroelectric projects, etc., in order to sustain high-level industrial activities, better connectivity, and growing energy demand. As a result, many international players are beginning to invest, and are setting up manufacturing facilities and distribution centers in the region to meet the growing demand and to capture the regional market. Construction machinery manufacturers, such as Liebherr, Caterpillar, Hitachi, and Sumitomo Corporation, offering rental services now face intense competition from numerous domestic and regional players, owing to competitive pricing and the availability of technologically advanced equipment. The global construction machinery market is characterized by the presence of numerous domestic and regional players, resulting in a highly fragmented market environment. 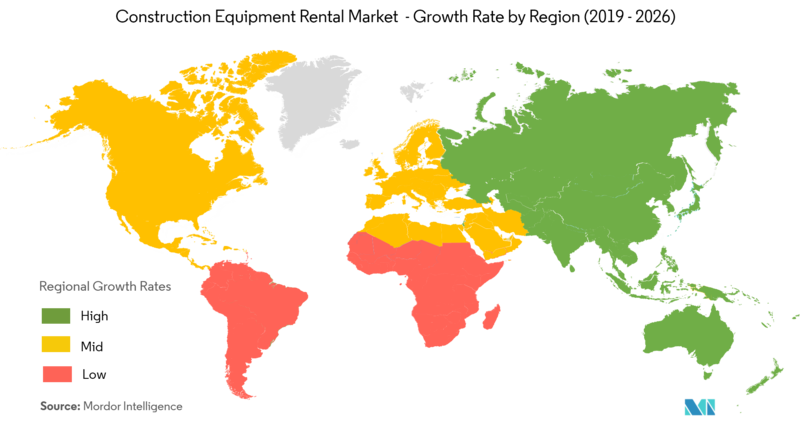 The eleven international and regional players in the market account for 13% of the market share and the remaining 87% of the market share is dominated by other players (domestic or regional players). The market is highly driven by mergers & acquisitions and joint venture activities. 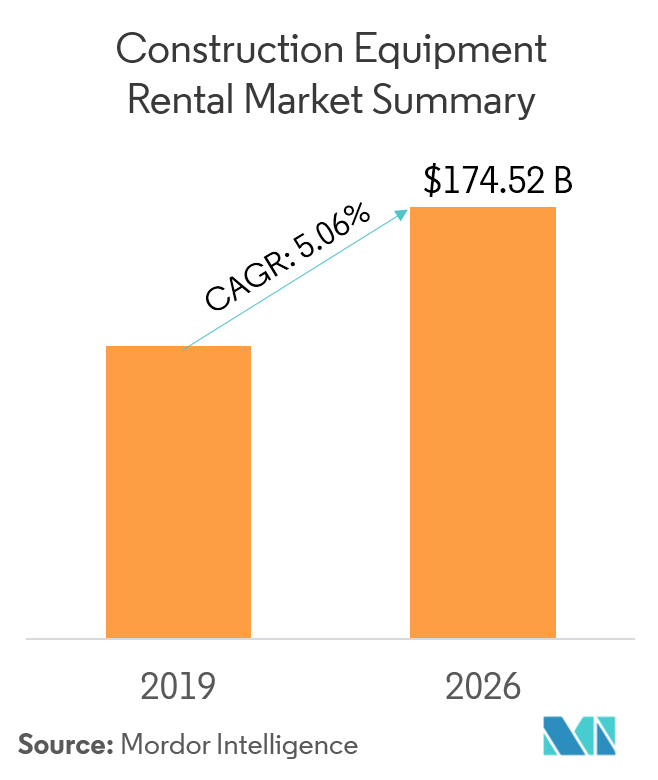 The rivalry among various machinery/equipment rental firms is high, as major players are trying to establish their footprint in developing countries, in order to grab a share in the growing market in Asia-Pacific and South American regions. The industry is highly competitive, because of limited diversity in the services offered under the construction equipment category. Note - The complete report includes market share details of other companies not shown here. 6.2.11 H&E Equipment Services Inc.